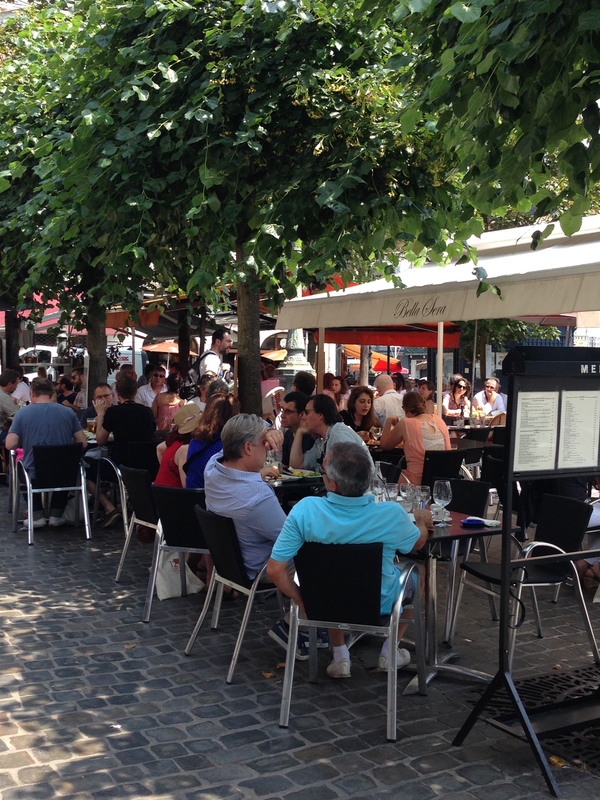 After a circuitous trek through CDG, and a long wait for our rental car, we headed south toward Bannay, where we would spend two days exploring the far eastern edge of the Loire Valley. At Bella Sera in Fountainbleu, one of three restaurants sharing a piece of Place Napoléon Bonaparte, the Salade du Jour was a perfect lunch for this 105°F day – large wedges of icy cold melon draped in prosciutto, fresh mozzarella, tagliatelle with pesto, and wedges of grapefruit, along with a carafe of the local rosé. 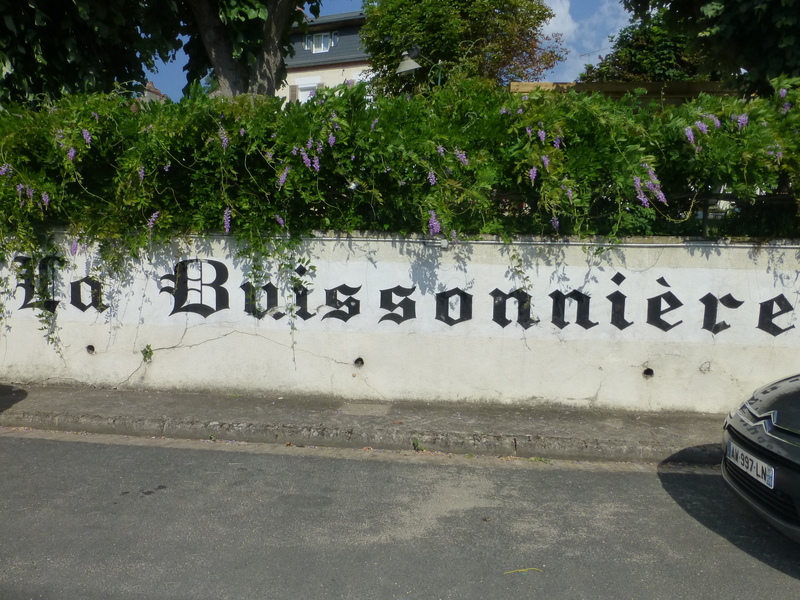 Back on the road, continuing south, we crossed the Loire and traveled alongside a green canal until we arrived Hotel La Buissonnèire, the name painted onto the front wall as it had been since first opening as a hotel in the early 1900s. Passing thro ugh an iron gate, we climbed the steps, red geraniums spilling over the wall, to the reception room of the main house, which contains the large table used for breakfast and dinners in the cooler weather. From the back of the house came our hostess Marie Oudry. “Bonjour, bonjour! Ah, trop chaud, trop chaud!, ” wiping her forehead and fanning herself as she came to greet us. 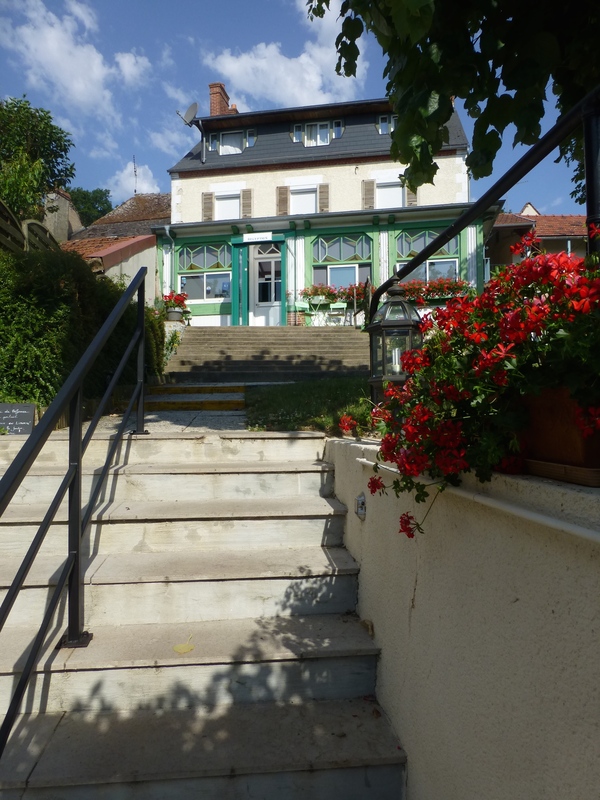 Reviews I had read before our trip, had warned that the hotel was not overly impressive from the outside, but everyone raved about the comfort and cleanliness of the rooms, and the hospitality of Mme. Oudry. Spot on. The two-story guest portion of the hotel forms an L around a courtyard, onto which the rooms open. 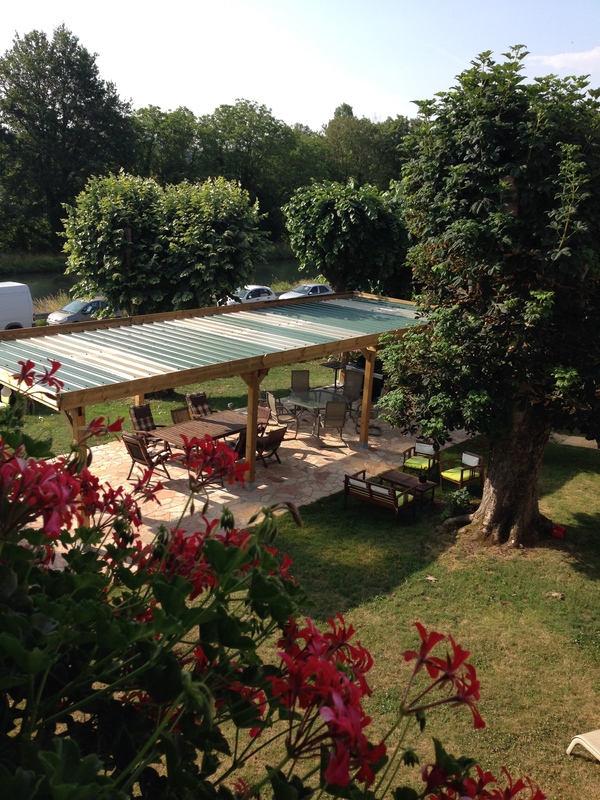 The courtyard offers a covered seating area and grill, as well as a child’s play house. A rabbit, guinea pig, and a kitten call the courtyard home. It is, essentially, a family’s backyard, comfortable and welcoming, with not a drop of pretension. Marie’s 10-year old daughter could be found playing there with her pets or cooling off with a hose during our stay. Roses, lavender, and rosemary border the walkway, trees shade the eating area. The nap and a cool shower refreshed us for dinner. We met in the courtyard around 7:30 for a glass of Sancerre and a chat with Marie, while she tended her chicken brochettes on the grill. 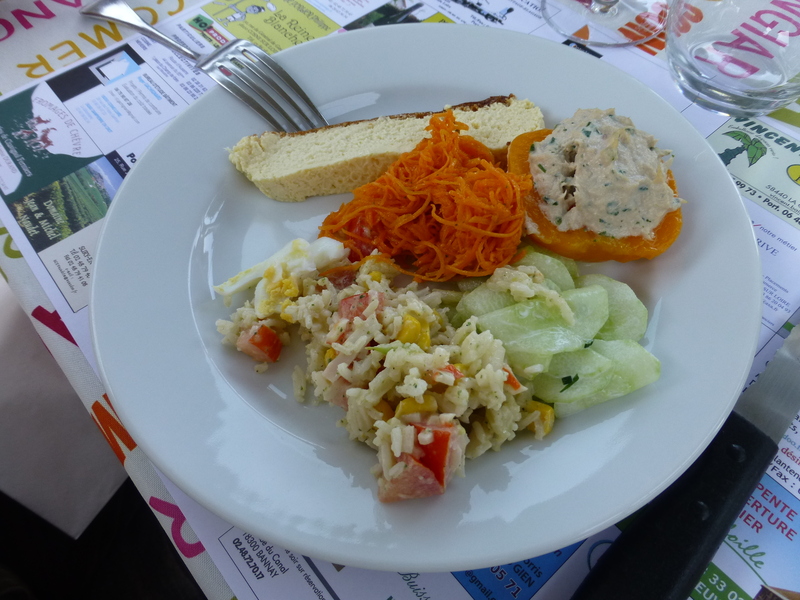 Soon we moved to the dinner table, and Marie began to bring out a succession of bowls and platters – cucumber salad, carrot salad, asparagus flan, peaches stuffed with tuna, bacon and leek tart, a cold rice salad studded with bits of corn, peppers, parsley, and slices of hard-boiled eggs, and the chicken brochettes. 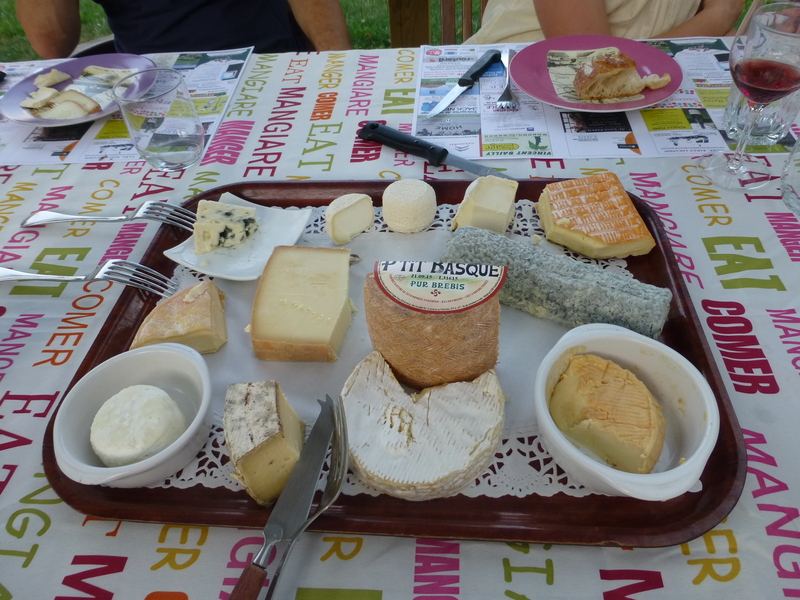 After that came the cheese course, with no fewer than nine selections, including the local specialty, a goat cheese, Crottin de Chavignol, and a lusciously creamy cow’s milk cheese from nearby Burgundy. Though we thought we could eat no more, it was impossible to turn down the concluding course – a slice of Marie’s apricot tart. And while the €17 per person price for this fantastic meal would have been reason enough to recommend it, better still was the fact that Marie joined us for dinner, along with another guest. It truly was like spending the night at a friend’s home. 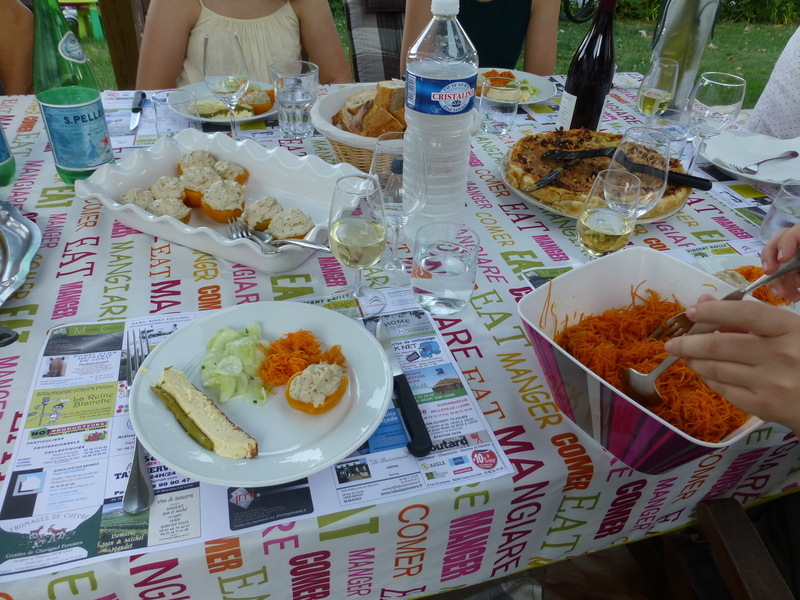 The perfect start to our Loire vacation! I think about my dinner tonight (so simple and relatively bland) and look at those pictures and I am inspired! The writing is also delicious, a lovely story to compliment Marie’s delightful and generous meal.